RIO DE JANEIRO, BRAZIL – After more than 25 years, Help Discotheque, a notorious symbol of prostitution in Rio, closed its doors after the Prefeitura (local government) initiated the process in 2008. 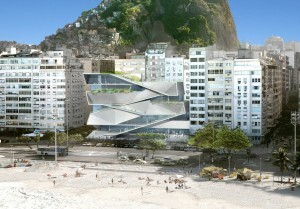 The prime location along Copacabana Beach will transform into a new landmark, the Museum of Image and Sound (MIS), and planned to be completed in the end of 2012. The planned Museum of Image and Sound (MIS), image provided by Secretaria de Cultura. Budgeted at R$70 million, the project is a partnership of state government with the Roberto Marinho Foundation. 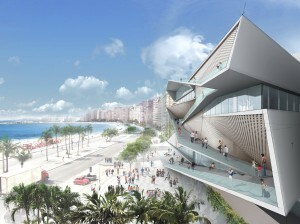 The demolition is expected to be finished in March 2011, clearing the area of 7,000 square meters on Avenida Atlantica. The design is by the American architect Elizabeth Diller, whose concept is a reproduction of the famous Copacabana sidewalk with its alternating black and white waves in a vertical version of a LEED (Leadership in Energy & Environmental Design) standard building. The first Museum of Image and Sound of Rio de Janeiro (RJ-MIS) was inaugurated on September 3, 1965, as part of the fourth centenary celebration of the city. Currently, the MIS has two headquarters: one in Lapa, where it houses the collection of text and audio, including the collection of the National Radio, and the other at Praça XV, where there are iconography, video and many newspaper exhibits. The new headquarters in Copacabana will have permanent showrooms, temporary spaces for research, classrooms for teaching activities, a theater with 300 seats, a shop, a cafeteria, a panoramic restaurant, a bar with a terrace, a piano bar, and an observatory on the seventh floor. Hugo Sukman, the curator of the future museum, says that it will be divided into different levels. The first two levels will be ESPÍRITO CARIOCA (Carioca Spirit), dedicated to city’s festivals and the Carnival and MÚSICA (Music), illustrating the history of samba, choro and bossa nova and their performers. Museum of Image and Sound (MIS), image provided by Secretaria de Cultura. The floor FELIZES TRÓPICOS (Happy Tropics) will display the Carioca way of life such as the production of soap operas and film, and museum of Carmen Miranda, now located in Flamengo. The final levels will be É SUL, É SAL, É SOL (Is South, Is Salt, Is Sun) dealing with the city’s link with nature, and NOITES CARIOCAS (Carioca Nights), showing the nightlife flavors, from samba to funk parties. As Copacabana prepares for it’s role in the 2016 Olympic Games, which will be centered around Maracanã stadium, and also take place in Deodoro and Barra de Tijuca, certainly many more renovation projects are expected in the next five years. Copacabana is much better without help. There is less crime, less drugs, and fewer kids begging tourist. There was a big element of Prostitution going on in around help. Most of these young ladies, not all were doing drugs. That brought the dealers, that brought the gansters and the bandits. All following the trail of money. I spend a lot of time there and I have seen the transition. In life, we need to focus on progress and change. Sometimes, change is painful but a nescessary evil for progress. A lot of (Gringoes) – tourist complain there are no dance clubs. They really mean, there is no great place to dance and pick up easy women. I will simply refer them to Lapa, or Leblon as well as Barra if they are looking for a nice area to Party. I like the new peaceful Copacabana. I am looking forward to the MIS completion. We need to be exposed to more of the Brazilian culture. MJ, can list the clubs you spoke of, the ones in Lapa and Leblon and Barra? Whos interested in museums??? bring back help i miss getting laid now, itis such a disaster to not only rio but to planet earth and i know my fellow country men agree with me, god bless america! !